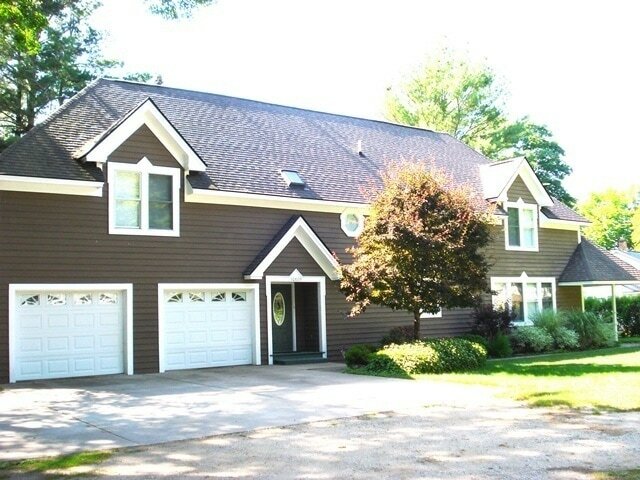 ALDEN HILLSIDE HOME – Has a very welcoming appeal—just a short little drive to the quaint town of Alden. The house has views of the South-East side of Torch Lake, so sit back and enjoy the amazing sunsets from the open and spacious walk around deck area. The view from this home is amazing, and right across the street is Torch Lake. It is across the street from the historic Train Depot where there is a public beach area. And the town of Alden offers you, the vacationer, a treat—to walk the town and see all the shops, places to eat and enjoy the small town atmosphere. A playground and tennis courts are there as well if that is of interest to you, and let’s not forget the beauty of being right by Torch Lake!! Crystal clear Caribbean blue water—bring your own boat or rent one at the many marinas around the lake and get out and enjoy the beauty you’ve just read about until now.!! This home is not going to disappoint any renter who has the opportunity to stay. With 3 bedrooms and 2.5 baths it sleeps 12 people just fine. A fireplace in every bedroom, all updated furniture; a very family friendly place to stay. The very large wrap-around deck area is great for sitting and enjoying the view by day, or grilling out and as stated before, enjoying the beautiful sunsets!!! You are 25 minutes to Traverse City, Bellaire and Elk Rapids—all offering fun and interesting things to see. Internet is available here, central air is not, but there are many fans and window air units placed about the house. A full modern kitchen gives you the opportunity to fix meals for your group and enjoy the very open dining area.